In A Few Words: This book took my imagination into the future, across the country, and beyond. -Fisher gets injured too often and he always gets better too quickly. 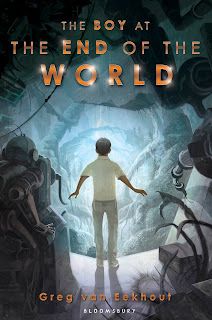 The Review: The Boy at the End of the World is an interesting book about a boy, a robot, and a woolly mammoth who go on a long adventure across the country after the human race was destroyed. Fisher wakes up in the ruins of an ark and doesn't know much more than how to fish. An ark is a preservation building built to keep the human race alive after they polluted the world. Fisher's ark was destroyed by it's own defense system but he thinks there is another ark across the country where he might find other humans. He goes to three different arks and find a different danger at each stop. The ending was good but it would have been better if it hadn't ended so quickly. I liked the characters a lot so I really wanted to know what happened to Fisher and his friends after the book ended. There weren't too many characters which made it easy to keep track of everyone. The characters I liked the most were Fisher and Zapper. Fisher was smart and adventurous like me and Zapper was hyper like me. I didn't like Click as much because he was overprotective and he pretty much said the same thing through the entire story. He always said stuff was too dangerous. I'm in fifth grade so the book was pretty easy to read but there were still some big words I had to ask my parents about. There were a lot of cool ideas in the book like the piranha-gators that attacked Fisher while he was sailing or the Intelligence which was a mixture of nanoworms that could change shape and take any form. There was a lot of fighting which was very fun and exciting. I also liked how the story was never too sad even though most of the humans were dead. I thought parts were really funny too, like when Fisher found a McDonalds sign or when he named the woolly mammoth Protein because he wanted to eat him. Overall, it was a very good book full of action and comedy and it would be perfect for fourth to seventh graders like me. If the author writes more books, I will definitely want to read them. Perfect point of view I think. I would much rather hear what a target reader had to say about a young reader book than another adult. Thanks for the review, Keegan! My son is still in first grade, but when he gets older I bet he'll enjoy this book, too. That's your first review? Wow, you're a natural.